“On their arrival at the first heaven, the angel Gabriel knocked at the gate and having told the porter who he was and that he brought Muhammad the friend of God with him by divine command, the gates, which he describes to be of an exceptional size, were immediately opened. This first heaven Muhammad tells us was made of pure silver with stars hanging by chains of pure gold, each being as large as Mount Noho near Mecca in Arabia. In these stars angels kept watch to guard heaven and to keep devils from approaching near for fear that they should overhear and know what was done there in heaven. “On first entering heaven, Muhammad said he met an old decrepit man, our first father Adam, who immediately embraced him and gave thanks to God for so great a son and then recommended himself to his prayers. As he entered further Muhammad said he saw a multitude of angels in all manner of shapes; some angels were in shapes of men, others in shapes of beasts, and others in shapes of birds. 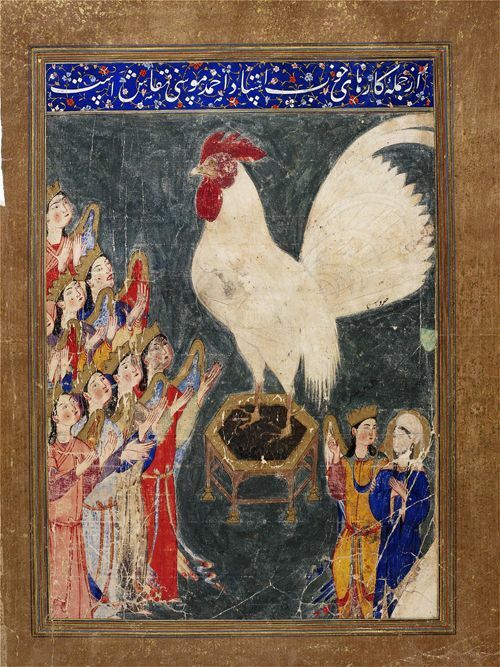 Among those who appeared in the several shapes of birds he saw a rooster as white as snow and so large that when his feet stood upon the first heaven his head reached up to the second heaven, which was the distance of five hundred years’ journey according to the rate we usually travel here on earth. However, the people, as they relate the matter of the seven heavens of their prophet, think it was much higher, telling us that the head of this chicken reached up through all the seven heavens as far as to the throne of God. 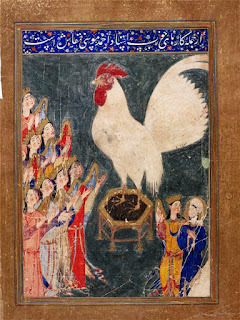 “In his description of the rooster Muhammad said that its wings were covered with rubies and pearls and that it extended one wing to the east and the other to the west, at a distance proportional to its height. Concerning all this, Muhammad tells us the angel Gabriel informed him that the angels interceded with God for all living creatures on earth. Those angels shaped like men interceded for men; those shaped like beasts interceded for beasts; and those shaped like birds interceded for birds according to their several kinds. As to the great rooster, he was the chief angel of the roosters. 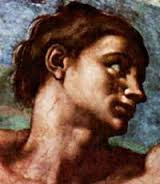 Every morning when God sang a holy hymn [to Himself? ], this rooster always joined in with his crowing, which is so loud that all who are in heaven and earth except men and fairies hear it, and then all the other roosters that are in heaven and earth below crow also. So that’s Muhammad’s first heaven. 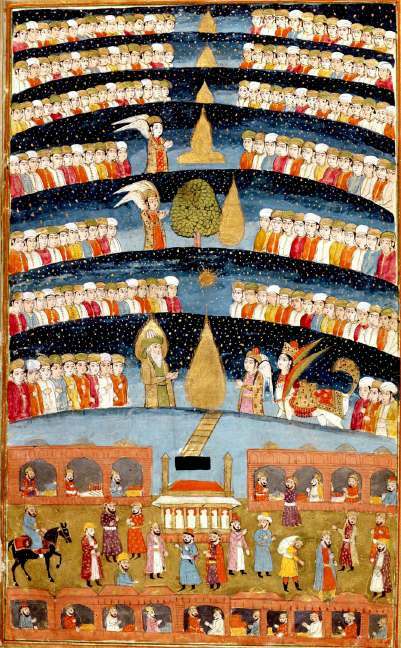 The next post will describe heavens two through seven, after which we’ll talk about Muhammad’s conversation with God (Allah), his descent from the Throne of God back to the Jewish Temple Mount (where today stands the Dome of the Rock), and finally back to Mecca on Al-Borak. 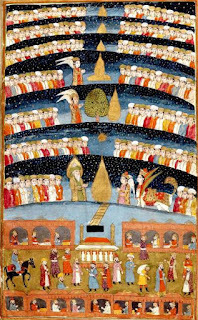 Following that will be the reaction of people in Mecca to Muhammad's Night Journey, and finally we will make observations and comments on the entire series of posts. Stay tuned!